Arkansas Derby 2014 (GI); Eight Too Hot To Trot Colts Set For Hot Springs: The 2014 (GI) Arkansas Derby is set to start on Saturday, April 12th, 2014 at Oaklawn Park in Hot Springs, Arkansas. This race is held annually in April for 3 year-olds ready to run 1 1/8 miles on the dirt for a whopping $1,000,000. The Arkansas Derby highlights the Racing Festival of the South on closing day of the meet and is one of the final prep races for the Kentucky Derby with 170 qualifying points up for grabs with 100/40/20/10 points for the top four finishers to add to their bankroll for a start in the 2014 Kentucky Derby. 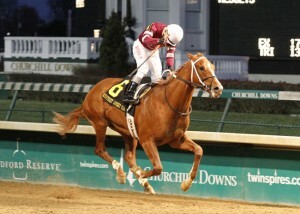 Tapiture, pictured above with jockey Ricardo Santana, Jr. in the Kentucky Jockey Club Stakes, breaks from post position #3 with jockey Joel Rosario in the Arkansas Derby on Saturday, Aril 12, 2014 at Oaklawn Park. Past winners of the race have gone on to win many American Classics. Sunny’s Halo won the 1983 Kentucky Derby as did Smarty Jones in 2004. Elocutionist (1976), Tank’s Prospect (1985), Pine Bluff (1992), Smarty Jones (2004), Afleet Alex (2005) and Curlin (2007) all won the Preakness Stakes. The horse Temperence Hill (1980) and Victory Gallop (1998) both went on to capture the Belmont Stakes. The 1994 winner, Concern, won that year’s Breeders’ Cup Classic. In 2004, Oaklawn offered a $5 million dollar bonus to any horse to sweep it’s three-year-old graded stakes including, The Rebel, The Arkansas Derby and then take the Kentucky Derby. This helped increase participation from the top three-year-olds in the country to the point where the American Graded Stakes Committee made the Arkansas Derby a (GI) race in 2010. Smarty Jones was the first horse to collect the bonus. I must say it’s probably my favorite prep-race leading up to the Kentucky Derby. The speed record is held by Althea in 1984 at 1:46.80, trained by D. Wayne Lukas and the only filly to win the race. 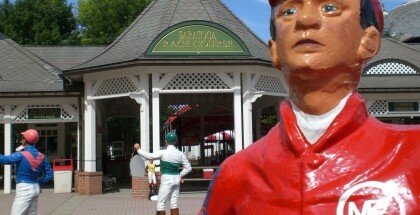 The most wins by a jockey are by Pat Day with 3 and eleven trainers have won this race twice. Overanalyze won this race last year in 1:51.94, the slowest time since 1978, for Todd Pletcher, which scored him the most wins now with three. The 2014 Arkansas Derby is set for a start time of 6:07 pm, CST and is the 11th race of the day out of 12 following the Oaklawn Handicap. My good buddy and fellow handicapper Sigi Mendoza and I are going to go toe-to-toe and break down the race, horse-by-horse. Last weekend Sigi nailed the trifecta by picking California Chrome to win along with Hoopertunity and Candy Boy in the Santa Anita Derby. My pick to win, Candy Boy, came in third. I used him and Sigis pick, California Chrome in the first leg of a pick 3 that hit for $252.30. Too bad I didn’t play it, story of my life. Onward we go. This is one tough looking group so take it away Sigi. Sigi: This Pletcher horse, returned from a long layoff at Gulfstream Park with a far third place, in a 7 furlongs race against a weaker field. Really don’t know what is he doing here, maybe is part of a strategy for Commissioner, the other Pletcher horse, so I’m passing him. Kari: Very lightly raced with record of 3:1:0:2. Broke maiden first out 7/12/13 at Belmont. On 8/11/13 was 3rd in the (GII) Saratoga Special. Followed that with 7 months off to run 3rd on 3/1/14 in an allowance at Gulfstream first time out, where he ran 4 wide and tired. Has 5 nice works since at Palm Meadows. New shooter with no points and he needs to hit top 2 to get in the field May with a career-best effort. Pass for winner but could be a nice play under. Has been withdrawn from the race. Sigi: Tapiture is the Asmussen Derby hopeful. He crushed the field in the Southwest Stakes, then was second by a ½ length behind Hoopertunity in the Rebel Stakes. Joel Rosario is now in the Irons and that’s a plus, but I think he’ll leave some gas in the tank for the Derby. I expect a huge effort from him, as usual, but he doesn’t need to win. He’s my third choice. Kari: This boy never runs a bad race, gutsy and has the running style to win the derby. Has a race record of 6:2:2:2 and sports a 105 speed figure. Last out in the Rebel, after being bounced around, he made a hole to run through but was outkicked for second. On 3/30 worked 5f in 1:00.3, 4/46. Has 42 points so already has a spot in the derby. Major player here with Rosario up jumping from Strong Mandate. One to beat. Sigi: He’s improving race by race, and now John Court picks up the mount. I like this rider switch, because Court knows how to win on this track. 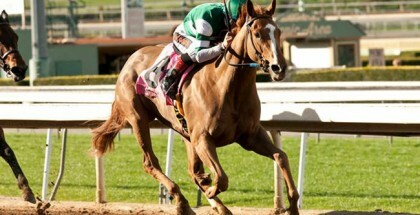 In his last race, Ride On Curlin was forced to a pace duel with Strong Mandate, in my opinion, this move was a mistake. Now I expect to see him more relaxed in the early stages to make his move at the right moment. His last drill was an excellent 7 F 1:26.4 , so I think he’s ready to roll. He’s my top pick. 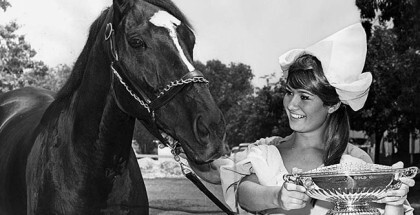 Kari: Has a race record of 8:2:1:4 with two third place finishes in both the Southwest and Rebel Stakes. The Rebel looked like he started the pinballing that affected a few others running here. It did earn him a 104 speed figure. Recently breezed 7f on this track very nicely. Ride On Curlin has 15 points towards the derby so he’ll be on the hunt and needs to finish in the top three to move forward. Definite contender. Sigi: It seems that this guy will be the rabbit, blinkers on indicates that. He was beaten by a weaker field last time, and I think he doesn’t want to run 1 1/8 miles. Surely he’ll be very active in the early stages, but no more. Kari: Thundergram is an interesting play here. Has a race record of 6:1:3:1, so only off the board once. Broke maiden on 2/10 at Oaklawn and recently finished 2nd on this track going 1 1/16 miles on 3/16. Wears blinkers for the first time and has some nice works. Significant class hike and should show some speed, rabbit for Conquest Titan? Would definitely use in exotics. Sigi: This Pletcher horse, bobbled at the start in the Sunland Derby, but took a distant third. Pletcher insists and is giving him another shot, but I think he’s a little slow to run in the Derby. Only if the pace is extremely hot, he could hit the board. Kari: This lightly raced colt has a record of 5:2:1:1. Has only 10 points so also needs to hit the top three here for a start in the gate May 3rd. Comes in off a 3rd place finish in the Sunland Derby (GIII) where he broke bad, threw a shoe to finish with interest. Has proven he can get the distance when he broke his maiden at Saratoga last August going 1 1 /8. Gets Mike Smith up and dangerous here in my opine. He needs a monster effort Saturday. Another major player. Sigi: This is an interesting horse who likes to come off the pace. He was 4th in the Tampa Bay Derby, a race with lack of pace where Ring Weekend was benefited. If the pace is hot, he should hit the board, but I see him like a Belmont Stakes horse. Kari: Showed lots of potential in the (GII) Holy Bull on 1/25/14 at Gulfstream running second to Intense Holiday. Last, ran fourth in the Tampa Bay Derby (GII) a little lackluster with a question-mark as to why. His highest speed figure is a 95 but I love how he closes out of the clouds with one late run. 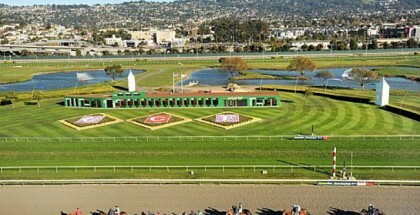 Has a work of 5f in 1:00.3, 2/20 on 3/29. With Calvin Borel up, who’s the bomb at getting late closers in, can we say Mine That Bird? Only has 9 points and must hit the top three to go to Churchill. If not, watch out Belmont. Playa for me. Sigi: Unbeaten in two starts, the Bob Baffert horse is returning from a minor injury who forced him to skip the San Felipe Stakes. He’s working very well for this race, and needs to be at least second, to qualify to the Kentucky Derby. I think this is a huge step up in class, and the lack of experience will hurt him. Kari: Mostly lightly raced one here coming off 2 wins, recently at Santa Anita going a mile on 2/13. On 1/4/14 broke his maiden at Santa Anita at first asking. Speedball city here and Baffert does very well at this track. This guy could be the old Game on Dude. On uncontested lead, watch out. Also owns a 105 speed figure and worked 7f Sunday in a bullet 1:23.80. New shooter with no points. Big player and will be bringing his A-game. Sigi: Like Elvis Presley’s song, “It’s now or never” for Strong Mandate (#equineanthem). Lukas still has a positive attitude and is giving him another shot. In his last race he was sent to the front and failed, now I expect to see him stalking the pace and making a big move. He’s my second choice. Kari: Another one here with 10 points that will need to make the top 3 to move forward. He worked 5f on 4/1 in 1:00.0 4/5. Still seeking his first victory this year after a second in the Southwest Takes (GIII)to Tapiture and a fourth in the (GII) Rebel on March 15th, where he dueled but got squeezed in the bumper-car parade. He gets a new rider here, Luis Saez, regular rider of Will Take Charge. Can he step it up? Sigi: In this race I’m going with Ride On Curlin for the win followed by Strong Mandate and Tapiture. I’m looking for a great value in this race, so I’m playing Ride on Curlin for the win-place-show. Kari: I agree with Sigi here on a great race for value. I’m hoping Thundergram blows the speed out front and a closer can swoop in for the win. I’m going with Conquest Titan for the win followed up by Bayern and Tapiture. However, I’m going to play a pick 3 for this race starting with race #9: 2,5/2,6/4,6,7 $12.00 Good luck to everyone and safe ride. Once again, thanks to Sigi for taking the time to handicap this race. You are truly a great friend and capper. Follow me and Sigi on twitter to keep up with all of the action! #Equineanthem below for your listening pleasure.